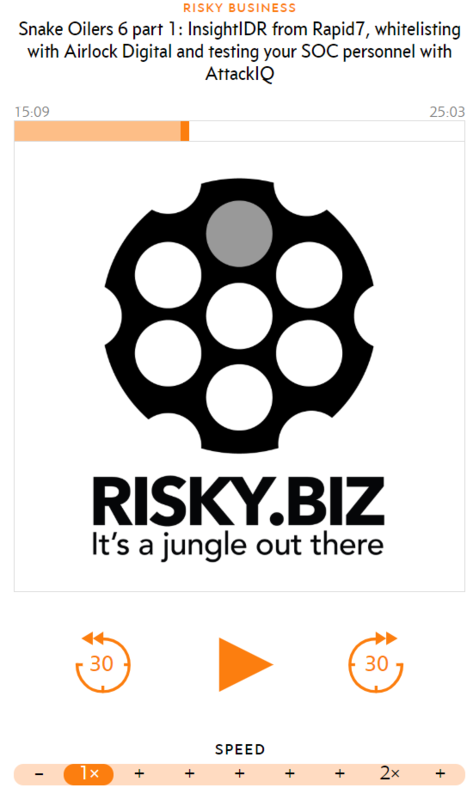 Airlock Digital was featured on Risky Business Snake Oilers June podcast and we have had a fantastic response. You can listen here to the interview between Patrick Gray and Airlock Co-Founder David Cottingham here. Airlock Digital, headquartered in Adelaide, South Australia, today announced that its application whitelisting solution now includes integrated file reputational lookups to streamline administration and allow non-cyber security specialists to easily assess the threat level of unknown files. The Airlock solution is specifically built around the Australian Signals Directorate’s (ASD) controls for application whitelisting, the number one cyber threat mitigation strategy in the Australian Information Security Manual (ISM). Airlock leads the industry in ease of use with inbuilt workflows enabling application whitelisting to be implemented in days, not months. Airlock improves implementation time by interrogating a customer’s existing environment to allow security and operations teams to quickly populate whitelists and create security policies. Integrated file reputational lookups – provided in partnership with global file classification leader, ReversingLabs – makes ongoing administration of the solution simple and easy. In addition to integrated file reputational lookups, Airlock now boasts increased performance with a single instance able to manage in excess of 20,000 devices, restriction of access to specific networks, increased collection and reporting on file metadata, and support for AppX digital signatures making granular trust of Windows Store applications possible. 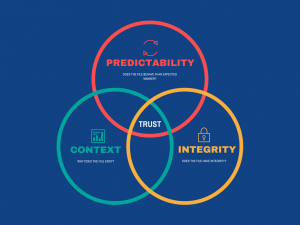 Trust, it’s a fundamental concept in cybersecurity and plays a vital role in the decisions we make, particularly if a risk based approach is taken to decision making. However, we don’t often think about how the concept of trust influences our decisions. This blog post will explore what role trust plays, in file based security. First, it’s important to note that trust is not a one size fits all concept and is unable to be applied equally across situations. For example, trust between family members must be thought of as a completely different concept to trust between networked computer endpoints. Noun: “Firm belief in the reliability, truth, or ability of someone or something”. “Firm belief in the purpose, origin and expected behavior of a file or software package”. 1) Context – The file must exist to serve a particular purpose and be attributable to an application or function. Humans should ask, why does the file exist? 2) Predictability – The file must behave in a predictable and consistent way when executed or handled. Humans should ask, does the file behave in a manner that is expected, given its context? 3) Integrity – The file must provide assurance that it has not been modified or tampered with in an unauthorized manner. Humans should ask, does the file have integrity? Answering these questions for every file on an average operating system can prove to be a daunting task, one that would simply be unfeasible using manual processes. Ultimately, we must rely on frameworks which can assist in determining if ‘trust’ should be placed in a file, at scale. Frameworks can take many forms, such as a threat intelligence feed, hashing algorithm or even a digital certificate validation mechanism. Regardless of their function, these frameworks must be robust, as we rely upon them to provide accurate information to inform our decisions. Now you may be thinking, what if I don’t fully ‘trust’ (have a firm belief in the reliability, truth or ability) the framework I am using? Where possible you should aim to use more than one framework to provide multiple answers for the ‘context’, ‘predictability’ and ‘integrity’ of a file. Multiple answers provide opportunity to compare the results across frameworks to ensure truthful answers are provided. Has the file been seen by a large amount of users? Has the file been signed by a vendor? Is the file located in the correct path? Does the file have a description explaining it’s purpose? When is the file invoked? Does the file request elevated permissions? Does the file load into the expected process? Does the file perform any system modifications? Drop files? Does the file extension match its content? Is the file digitally signed by a vendor? Does the files hash value match a vendor provided hash value? Has the file changed hash values since I have seen the file? Does the files hash match a known good sample based on threat intelligence? These methods are not an exhaustive list and barely scratch the surface, but hopefully provide a starting point for some ideas which can be used to determine if you should trust a file or not. Airlock Application Whitelisting provides a robust solution enabling administrators to easily choose which files they should trust in an environment. 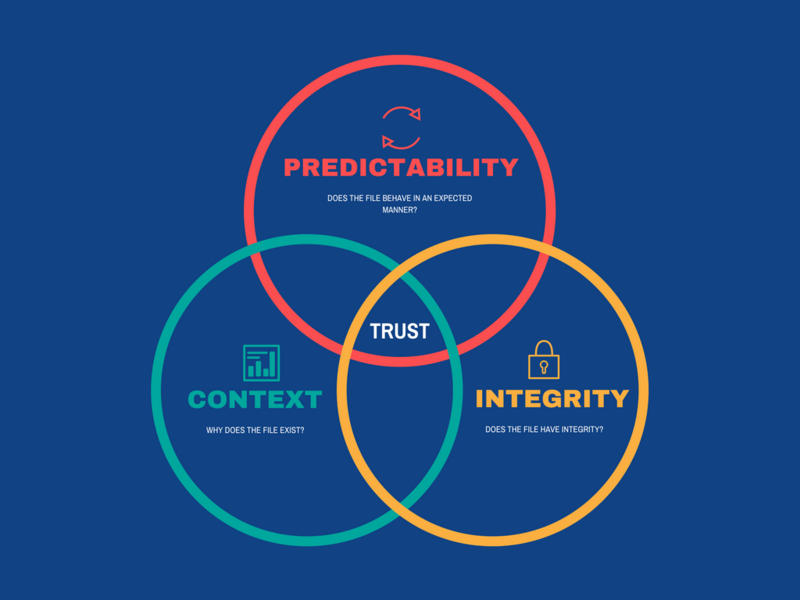 Most importantly, Airlock incorporates multiple frameworks which are needed to quickly determine trust. 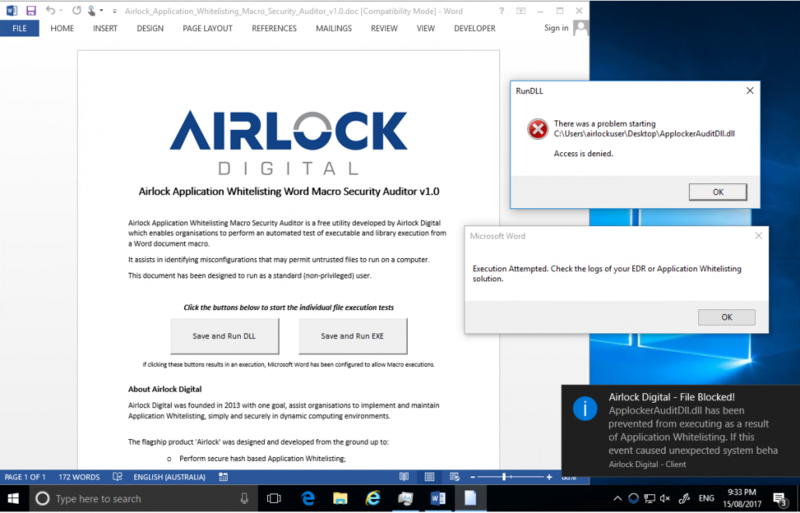 Today Airlock Digital is releasing a free Microsoft Word document to test ‘Chained Trust’ in EDR and Application Whitelisting solutions. is where a product will trust a parent process (such as winword.exe) and automatically place trust in any spawned child processes. Security products that are configured to use ‘Chained Trust’ may provide a reduced level of security. This document contains Macro code, which attempts to drop either a .dll or .exe file in the documents working directory and execute it, allowing you to audit product configurations. Please let us know if you find this useful or have any feedback by contacting info@airlockdigital.com or @airlockdigital. The Petya ransomware outbreak represents an evolution in the sophistication of ransomware. Employing a number of different strategies for distribution and infection the Petya ransomware has impacted small and large organisations across the globe. This outbreak is another reminder that signature based detection is not effective in todays threat landscape. In this video you will see the execution of Petya on a victim endpoint and discover how application whitelisting with Airlock provides zero-day proactive protection against Peta and other ransomware variants. Remember to click the Full Screen button on the video to get a better view of the product interface.